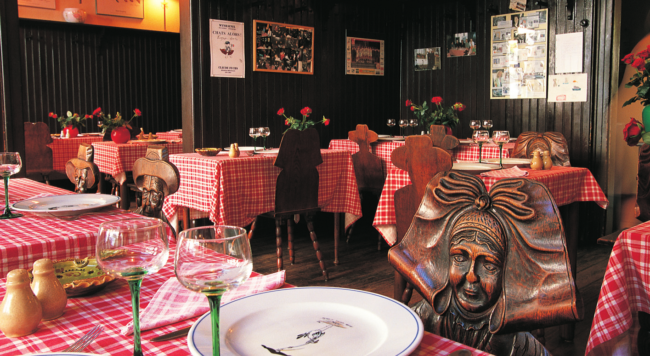 Before getting stuck into some of the richer and creamier dishes that Alsace has to offer, tourists can take the opportunity (and the low calorie option) to visit local museums dedicated to gingerbread, chocolate, wine and eau de vie for an overview of the food and drink it’s famous for. To find out more, a number of farms and vineyards are open to visitors who want to learn about how Munster cheese and wines like the sparkling Crémant d’Alsace are produced, perhaps taste a little mouthful and buy some supplies for a picnic or to share with friends back home. Alsace is well known for its white wines and the region is a prime location for growing grapes, thanks to the Vosges mountain range, which serves to protect the area from the elements. But that’s not all. At least half of the beer drunk in France comes from one of six breweries in Alsace. Brandy and schnapps are also produced locally. Flammeküeche (or tarte flambée as it is also known) looks much like a pizza, smothered in a creamy sauce and topped with a mixture of delicious bacon bits and onion. Tourte de la Vallée de Munster is a pie filled with a seasoned mixture of pork, onions, eggs and breadcrumbs – ideal for a quick lunch. Come dinner time, you’ll find Baeckeoffe on the menu, a hearty stew of marinated meat, potatoes, onions and carrots. 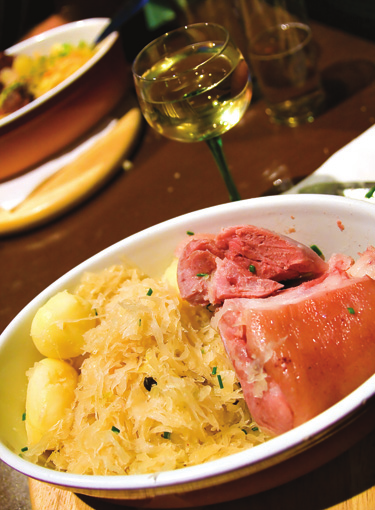 Choucroute is also popular in these parts and when the sauerkraut is mixed with ham and ‘knack’ sausages, trotters and ribs, makes a meal in itself! White asparagus from Alsace should be devoured while it lasts between April and June. In spite of the amount of pork required for such dishes, the region now has fewer pig breeders than in previous years. However, its forests are a breeding ground for boar. These ensure a regular supply of game in local restaurants in the autumn. The boar meat makes an excellent sanglier terrine. In the south of Alsace, where carp is the catch of the day, the fish is commonly served fried alongside a portion chips or a few new potatoes. Carpe frite goes nicely with the white wines produced in the area, from the delicate Riesling to the dry Muscat d’Alsace and smoky Pinot Blanc. Et pour déssert? Any meal or coffee break would not be complete without a slice of cake and Alsace has several of its own invention. Kugelhopf is made with almonds and raisins. The dome shape and hole in the middle makes it instantly recognisable. Another option is a light plum custard tart. 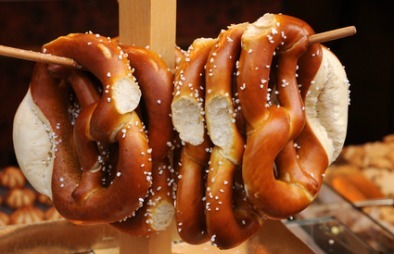 Pretzels too are perennially popular in this Germanic corner of France.